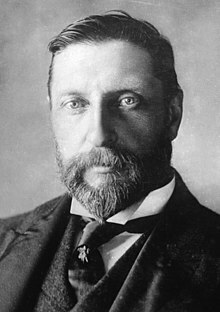 Sir Henry Rider Haggard, KBE, Kt (/ˈhæɡərd/; 22 June 1856 – 14 May 1925) was an English writer of adventure fiction set in exotic locations, predominantly Africa, and a pioneer of the lost world literary genre. He was also involved in agricultural reform throughout the British Empire. His stories, situated at the lighter end of Victorian literature, continue to be popular and influential. Henry Rider Haggard, generally known as H. Rider Haggard or Rider Haggard, was born at Bradenham, Norfolk, the eighth of ten children, to Sir William Meybohm Rider Haggard, a barrister, and Ella Doveton, an author and poet. His father was born in Saint Petersburg, Russia, to British parents. Haggard was initially sent to Garsington Rectory in Oxfordshire to study under Reverend H. J. Graham, but unlike his elder brothers who graduated from various private schools, he attended Ipswich Grammar School. This was because his father, who perhaps regarded him as somebody who was not going to amount to much, could no longer afford to maintain his expensive private education. After failing his army entrance exam, he was sent to a private crammer in London to prepare for the entrance exam for the British Foreign Office, which he never sat. During his two years in London he came into contact with people interested in the study of psychical phenomena. In 1875, Haggard's father sent him to what is now South Africa to take up an unpaid position as assistant to the secretary to Sir Henry Bulwer, Lieutenant-Governor of the Colony of Natal. In 1876 he was transferred to the staff of Sir Theophilus Shepstone, Special Commissioner for the Transvaal. It was in this role that Haggard was present in Pretoria in April 1877 for the official announcement of the British annexation of the Boer Republic of the Transvaal. Indeed, Haggard raised the Union flag and read out much of the proclamation following the loss of voice of the official originally entrusted with the duty. At about that time, Haggard fell in love with Mary Elizabeth "Lilly" Jackson, whom he intended to marry once he obtained paid employment in Africa. In 1878 he became Registrar of the High Court in the Transvaal, and wrote to his father informing him that he intended to return to England and marry her. His father forbade it until Haggard had made a career for himself, and by 1879 Jackson had married Frank Archer, a well-to-do banker. When Haggard eventually returned to England, he married a friend of his sister, Marianna Louisa Margitson (1859–1943) in 1880, and the couple travelled to Africa together. They had a son named Jack (who died of measles at age 10) and three daughters, Angela, Dorothy and Lilias. Lilias Rider Haggard became an author, edited The Rabbit Skin Cap and I Walked By Night, and wrote a biography of her father entitled The Cloak That I Left (published in 1951). Moving back to England in 1882, the couple settled in Ditchingham, Norfolk, Louisa's ancestral home. Later they lived in Kessingland and had connections with the church in Bungay, Suffolk. Haggard turned to the study of law and was called to the bar in 1884. His practice of law was desultory and much of his time was taken up by the writing of novels which he saw as being more profitable. Haggard lived at 69 Gunterstone Road in Hammersmith, London, from mid-1885 to circa April 1888. It was at this Hammersmith address that he completed King Solomon's Mines (published September 1885). Haggard was heavily influenced by the larger-than-life adventurers whom he met in colonial Africa, most notably Frederick Selous and Frederick Russell Burnham. He created his Allan Quatermain adventures under their influence, during a time when great mineral wealth was being discovered in Africa, as well as the ruins of ancient lost civilisations of the continent, such as Great Zimbabwe. Three of his books, The Wizard (1896), Black Heart and White Heart; a Zulu Idyll (1896), and Elissa; the Doom of Zimbabwe (1898), are dedicated to Burnham's daughter Nada, the first white child born in Bulawayo; she had been named after Haggard's 1892 book Nada the Lily. Haggard belonged to the Athenaeum, Savile, and Authors' clubs. Years later, when Haggard was a successful novelist, he was contacted by his former love, Lilly Archer, née Jackson. She had been deserted by her husband, who had embezzled funds entrusted to him and had fled bankrupt to Africa. Haggard installed her and her sons in a house and saw to the children's education. Lilly eventually followed her husband to Africa, where he infected her with syphilis before dying of it himself. Lilly returned to England in late 1907, where Haggard again supported her until her death on 22 April 1909. These details were not generally known until the publication of Haggard's 1981 biography by Sydney Higgins. After returning to England in 1882, Haggard published a book on the political situation in South Africa, as well as a handful of unsuccessful novels,  before writing the book for which he is most famous, King Solomon's Mines. He accepted a 10 percent royalty rather than £100 for the copyright. A sequel soon followed entitled Allan Quatermain, followed by She and its sequel Ayesha, swashbuckling adventure novels set in the context of the Scramble for Africa (although the action of Ayesha happens in Tibet). The hugely popular King Solomon's Mines is sometimes considered the first of the Lost World genre. She is generally considered to be one of the classics of imaginative literature. and with 83 million copies sold by 1965, it is one of the best-selling books of all time. He is also remembered for Nada the Lily (a tale of adventure among the Zulus) and the epic Viking romance, Eric Brighteyes. His novels portray many of the stereotypes associated with colonialism, yet they are unusual for the degree of sympathy with which the native populations are portrayed. Africans often play heroic roles in the novels, although the protagonists are typically European (though not invariably). Notable examples are the heroic Zulu warrior Umslopogaas and Ignosi, the rightful king of Kukuanaland, in King Solomon's Mines. Having developed an intense mutual friendship with the three Englishmen who help him regain his throne, he accepts their advice and abolishes witch-hunts and arbitrary capital punishment. Three of Haggard's novels were written in collaboration with his friend Andrew Lang who shared his interest in the spiritual realm and paranormal phenomena. Haggard also wrote about agricultural and social reform, in part inspired by his experiences in Africa, but also based on what he saw in Europe. At the end of his life, he was a staunch opponent of Bolshevism, a position that he shared with his friend Rudyard Kipling. The two had bonded upon Kipling's arrival at London in 1889 largely on the strength of their shared opinions, and the two remained lifelong friends. Haggard was involved in reforming agriculture and was a member of many commissions on land use and related affairs, work that involved several trips to the Colonies and Dominions. It eventually led to the passage of the 1909 Development Bill. He stood unsuccessfully for Parliament as a Conservative candidate for the Eastern division of Norfolk in the 1895 summer election, losing by 197 votes. He was appointed a Knight Bachelor in 1912 and a Knight Commander of the Order of the British Empire in the 1919 New Year Honours. Haggard died on 14 May 1925 in Marylebone, London aged 68. His ashes were buried at St Mary's Church, Ditchingham. His papers are held at the Norfolk Record Office. Haggard's stories are still widely read today. Ayesha, the female protagonist of She, has been cited as a prototype by psychoanalysts such as Sigmund Freud (in The Interpretation of Dreams) and Carl Jung. Her epithet "She Who Must Be Obeyed" is used by British author John Mortimer in his Rumpole of the Bailey series as the private name which the lead character uses for his wife, Hilda, before whom he trembles at home (despite the fact that he is a barrister with some skill in court). Haggard's Lost World genre influenced popular American pulp writers such as Edgar Rice Burroughs, Robert E. Howard, Talbot Mundy, Philip José Farmer, and Abraham Merritt. Allan Quatermain, the adventure hero of King Solomon's Mines and its sequel Allan Quatermain, was a template for the American character Indiana Jones. Quatermain has gained recent popularity thanks to being a main character in the League of Extraordinary Gentlemen. Graham Greene, in an essay about Haggard, stated, "Enchantment is just what this writer exercised; he fixed pictures in our minds that thirty years have been unable to wear away." Haggard was praised in 1965 by Roger Lancelyn Green, one of the Oxford Inklings, as a writer of a consistently high level of "literary skill and sheer imaginative power" and a co-originator with Robert Louis Stevenson of the Age of the Story Tellers. The first chapter of his book People of the Mist is credited with inspiring the motto of the Royal Air Force (formerly the Royal Flying Corps), Per ardua ad astra. Rider Haggard has been widely critiqued for perpetuating negative stereotypes about non-Europeans. For instance, in his canonical book Decolonizing the Mind, Ngũgĩ wa Thiong'o refers to Haggard as one of the "geniuses of racism." The Kenyan author and academic Micere Mugo wrote in 1973 that reading the description of "an old African woman in Rider Haggard's King Solomon's Mines had for a long time made her feel mortal terror whenever she encountered old African women." During the 19th century, Haggard was one of many individuals who contributed to children's literature. Morton N. Cohen described King Solomon's Mines as a story that has "universal interest, for grown-ups as well as youngsters". Haggard himself wanted to write the book for boys, but it ultimately had an influence on children and adults around the world. Cohen explained, "King Solomon’s Mines was being read in the public schools [and] aloud in class-rooms". This novel has been adapted at least six times. The first version, King Solomon's Mines, directed by Robert Stevenson, premiered in 1937. The best known version premiered in 1950: King Solomon's Mines, directed by Compton Bennett and Andrew Marton, was followed in 1959 by a sequel, Watusi. In 1979 a low-budget version directed by Alvin Rakoff, King Solomon's Treasure, combined both King Solomon's Mines and Allan Quatermain in one story. The 1985 film King Solomon's Mines was a tongue-in-cheek parody of the story, with a 1987 sequel in the same vein, Allan Quatermain and the Lost City of Gold. Around the same time an Australian animated TV film came out, King Solomon's Mines. In 2004 an American TV mini-series, King Solomon's Mines starred Patrick Swayze. In 2008 a direct-to-video adaptation, Allan Quatermain and the Temple of Skulls, was released by Mark Atkins; it bore more resemblance to Indiana Jones than the novel. She has been adapted for the cinema at least ten times, and was one of the earliest films to be made, in 1899 as La Colonne de feu ( The Pillar of Fire), by Georges Méliès. A 1911 version starred Marguerite Snow, a British-produced version appeared in 1916, and in 1917 Valeska Suratt appeared in a production for Fox which is lost. In 1925 a silent film of She, starring Betty Blythe, was produced with the active participation of Rider Haggard, who wrote the intertitles. This film combines elements from all the books in the series. A decade later another cinematic version of the novels was released, featuring Helen Gahagan, Randolph Scott and Nigel Bruce. Unlike the book and the other films, this 1935 version was set in the Arctic, rather than Africa, and depicts the ancient civilisation of the story in an Art Deco style, with music by Max Steiner. The 1965 film She was produced by Hammer Film Productions; it starred Ursula Andress as Ayesha and John Richardson as her reincarnated love, with Peter Cushing and Bernard Cribbins as other members of the expedition. In 2001 another adaptation was released direct-to-video with Ian Duncan as Leo Vincey, Ophélie Winter as Ayesha and Marie Bäumer as Roxane. The film Dawn was released in 1917, starring Hubert Carter and Annie Esmond. The locality of Rider, British Columbia, was named after him. Louis Henri Boussenard (1847–1911), French author of adventure novels, dubbed the French Rider Haggard during his lifetime. Pierre Benoit (1886-1962), French author whose novel L'Atlantide is similar to She. Emilio Salgari (1862–1911), Italian author of adventure novels and founder of the adventure genre in Italy. Alexandre Dumas, père (1802–1870), French author of historical novels of high adventure. Anthony Hope (1863–1933), English author of adventure novels such as The Prisoner of Zenda. P. C. Wren (1875–1941), British writer of adventure fiction. He is remembered best for Beau Geste, a much-filmed book of 1924 involving the French Foreign Legion in North Africa, and its sequels, Beau Sabreur and Beau Ideal. ^ a b "Rider Haggard Dies in London Hospital. Author of 'She,' 'King Solomon's Mines' and Many Other Novels Was Nearly 69. He Was Knighted in 1912. An Authority on Agriculture and Sociology. Served on Government Missions". New York Times. 15 May 1925. Retrieved 18 November 2012. ^ "Lost Races, Forgotten Cities". Violetbooks.com. 14 May 1925. Archived from the original on 15 June 2014. Retrieved 15 May 2014. ^ "The Days of My Life, by H. Rider Haggard : CHAPTER 1". ebooks.adelaide.edu.au. ^ a b Haggard, H. Rider (1989). "Introduction and Chronology; by Dennis Butts. In:". King Solomon's Mines. Oxford University Press. vii–xxviii. ^ Haggard, H. Rider (2002). "H. Rider Haggard". King Solomon's Mines. Modern Library Paperback Edition. v.
^ Haggard, H. Rider (2002). "H. Rider Haggard". King Solomon's Mines. Modern Library Paperback Edition. vi. ^ Pakenham, Thomas (1992) The Scramble for Africa: White Man's Conquest of the Dark Continent from 1876–1912, Avon Books, New York. ISBN 0-380-71999-1. ^ Mandiringana, E.; Stapleton, T. J. (1998). "The Literary Legacy of Frederick Courteney Selous". History in Africa. African Studies Association. 25: 199–218. doi:10.2307/3172188. JSTOR 3172188. ^ Pearson, Edmund Lester. "Theodore Roosevelt, Chapter XI: The Lion Hunter". Humanities Web. Retrieved 18 December 2006. ^ "HAGGARD, Henry Rider". Who's Who. Vol. 59. 1907. p. 756. ^ Ellis 1978, p. 89. ^ Etherington 1984, p. 99. ^ According to Robert E. Morsberger in the "Afterword" of King Solomon's Mines, The Reader's Digest (1993). ^ "Supernatural Horror In Literature by H. P. Lovecraft". ^ "Cinema: Waiting for Leo". TIME.com. 17 September 1965. ^ Kipling, Rudyard (1937). Something of Myself. London: Macmillan & Co.
^ Cohen 1961, pp. 239–85. ^ Cohen 1961, p. 178. ^ Cohen 1961, pp. 157–58. ^ Higgins 1981, p. 241. ^ Pocock 1993, p. 288. ^ "Rider Haggard Papers". Norfolk Record Office. Retrieved 20 March 2013. ^ "Star Wars Origins - Other Science Fiction Influences". ^ "Based on a 1885 novel by Henry Rider Haggard Archived 5 December 2008 at the Wayback Machine, the exploits of Alan Quatermain have long served as a template for the Indiana Jones character. In this particular film, King Solomon's Mines (1950), Quatermain finds himself unwillingly thrust into a worldwide search for the legendary mines of King Solomon. The look and feel of Indiana and his past adventures are quite apparent here, and his new quest follows some very similar through lines. Like Quatermain, Jones is reluctantly forced into helping the Russians find the Lost Temple of Akator and the Crystal Skulls mentioned in the film's title. Both Quatermain and Jones are confronted by angry villagers and a myriad of dangerous booby traps. Look to King Solomon's Mines for a good idea on the feel and tone Lucas and Spielberg are after with their latest Indiana Jones outing". ^ Greene, Graham (1969). Rider Haggard's Secret. Collected Essays. New York: Viking Press. pp. 209–214. ^ "The Royal Air Force MottoThe Royal Air Force Motto". RAF. 25 April 2012. Retrieved 10 June 2012. ^ a b Thiong'o, Ngugi wa (1 January 1994). Decolonising the mind: the politics of language in African literature. East African Publishers. p. 18. ISBN 9789966466846. ^ a b Cohen, Morton N., "The Tale of African Adventure." Rider Haggard: His Life and Works. New York: Walker and Company, 1961. 89–95. Print. ^ "Jess". 21 May 1912 – via IMDb. ^ "Jess". 18 February 1914 – via IMDb. ^ "Heart and Soul". 21 May 1917 – via IMDb. ^ "The Stronger Passion". 1 May 1921 – via IMDb. ^ "Swallow". 20 July 1922 – via IMDb. ^ "Stella". 1 January 2000 – via IMDb. ^ "The Moon of Israel". 24 October 1924 – via IMDb. Cohen, Morton Norton (1961). Rider Haggard His life and Works. New York: Walker and Company. Cox, Noel (2013). Sir Henry Rider Haggard: A collection of commentaries on his novels. Aberystwyth: CreateSpace Independent Publishing Platform. ISBN 9781494397746. Ellis, Peter (1978). H. Rider Haggard: A Voice from the Infinite. Routledge. ISBN 9780710211941. Etherington, Norman (1984). Rider Haggard. Twayne Publishers. ISBN 9780805768695. Haggard, H. Rider (1926). The Days of My Life. Longmans. Higgins, D.S. (1981). Rider Haggard: The Great Storyteller. London: Cassell. ISBN 0-304-30827-7. Katz, Wendy Roberta (2010). Rider Haggard and the Fiction of Empire: A Critical Study of British Imperial Fiction. Cambridge University Press. ISBN 9780521131131. Monsman, Gerald Cornelius (2006). H. Rider Haggard on the imperial frontier. ELT Press. ISBN 9780944318218. Pocock, Tom (1993). Rider Haggard: And the Lost Empire. Weidenfeld and Nicolson. ISBN 9780297813088. Salmonson, Jessica Amanda. "The H. Rider Haggard Filmography". Violet Books. Archived from the original on 13 January 2009. Holterhoff, Kate. "Visual Haggard: The Illustration Archive". This page is based on the Wikipedia article H. Rider Haggard; it is used under the Creative Commons Attribution-ShareAlike 3.0 Unported License (CC-BY-SA). You may redistribute it, verbatim or modified, providing that you comply with the terms of the CC-BY-SA.